This is a lovely ride taking you down the tree lined St Kilda Road past the Shrine of Remembrance. Albert Park was once a swamp and now hosts a range of recreational activities. It is worth riding out to the end of the St Kilda pier. Fairy penguins nest in the rocks at the end of the pier. The ride along the beach is superb especially if you have a south wind and a sunny day. There are plenty of cafes along Fitzroy Street. You can also ride out to the historic cafe at the end of the pier. Also there are a number of cafes along the beach. Sandbar is a good one. There are toilets along the beach. Flat, sealed surfaces, bike path all the way. Warning. Don’t try to do this ride when the Grand Prix is on or in the 2 weeks before or after. The path through Albert Park may be closed. Check the date for the Grand Prix. A Little Penguin (aka Fairy Penguin) at the end of St Kilda Pier. Start on the shared footpath/bikepath in St Kilda Rd from Federation Square and cross Princess Bridge. Head down St Kilda Road on the shared footpath/bikepath past the Shrine of Remembrance to Albert Rd. Turn right into Albert Road and ride along the path on the north side of Albert Park. There are a few traffic lights to negotiate here. At Aughtie Drive turn left and follow the path south through Albert Park. The lane on the east side of St Kilda Park Primary School takes you to Fitzroy Street. Turn right into Fitzroy Street and ride towards the sea. 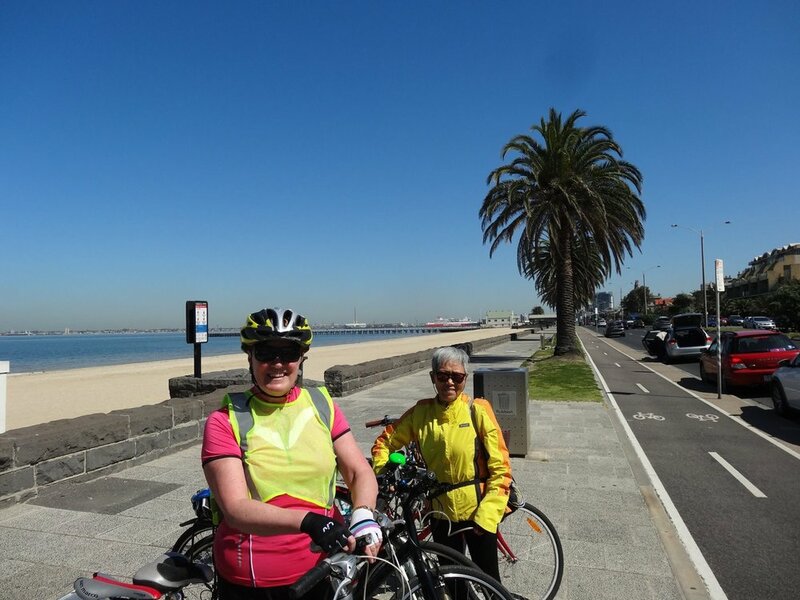 After the pier the ride then follows the beach northwest to Port Melbourne. Turn right at Beacon Cove and then follow the light rail line (tram) to the Melbourne Exhibition Centre. To return to your starting point, cross at the pedestrian crossing to the Crown Casino and ride east along Southbank till you get to Princess Bridge. Riding along Southbank can be tricky, as there are often many pedestrians. Bay Explorer (ride details 9 and 10). Follow steps 1 to 6 above. At step 7 turn left at St Kilda when you reach the Bay Trail. Westgate Park (ride details 1 to 11 in reverse). At Station Pier continue straight ahead along the Bay Trail instead of turning right to the light rail trail.